As I’ve said before, Alma de Cuba is one of my favorite restaurants in Philadelphia. I’ve shared my version of their Skirt Steak and today’s I’m sharing my version of another favorite – Vaca Frita! Vaca Frita means fried cow in Spanish. In the traditional recipe, flank steak or skirt steak are cooked twice creating a delectable dish. My recipe uses boneless chuck roast instead of skirt steak for two reasons – first, I’m serving four people and a chuck roast is just the perfect size for us and second, skirt and flank steaks are just so darn expensive for the smallest steak. I have to say that after shredding and frying the roast no one would have been able to tell the difference! This is another winner – the combined flavors of the fried shredded meat along with the onions & peppers was stupendous…and with the addition of a side of Spanish Red Rice and Goya Maduros…all I can say is WOW! Go ahead, give it a try…all of these flavors together are just incredible! Place the oil and the roast in a large deep skillet. Turn the heat up to high. Sprinkle on the packet of Sazon and add the chopped onion. Add the bay leaf, red wine, orange juice and water. Bring to a boil; reduce heat, cover and simmer 2 hours. When the roast is almost done the first cooking, sauté the sliced onions & peppers until tender-crisp. Meanwhile, shred the roast, discarding the fat. 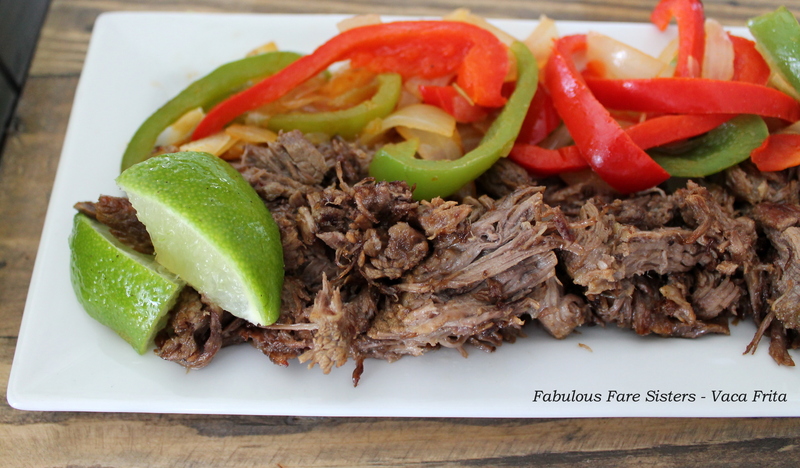 Squeeze the juice of 1 lime all over the shredded beef. In a skillet, heat canola oil and a batch of the shredded beef on high heat. Sprinkle with cumin, garlic powder and salt; turning the beef to crisp up all sides (5-7 minutes). Fry the shredded beef in more than one batch so as not to overcrowd the skillet. This is the second cooking that is required to make this officially fried cow or Vaca Frita! To serve: Top the crispy shredded beef with the sautéed onions & peppers and squeeze with additional lime juice. I recommend serving with a side of Spanish Red Rice and Goya Maduros to get the full flavor combination! This recipe has been shared on Tickle My Tastebuds Tuesday, The Pin Junkie, Funtastic Friday, Weekend Potluck and Saucy Saturdays…go check it out and then go visit some other great sites! And such a pretty presentation. Yeah. This would def go well with some spanish rice. Mmm mmm!! Love the colours. A great, healthy meal! 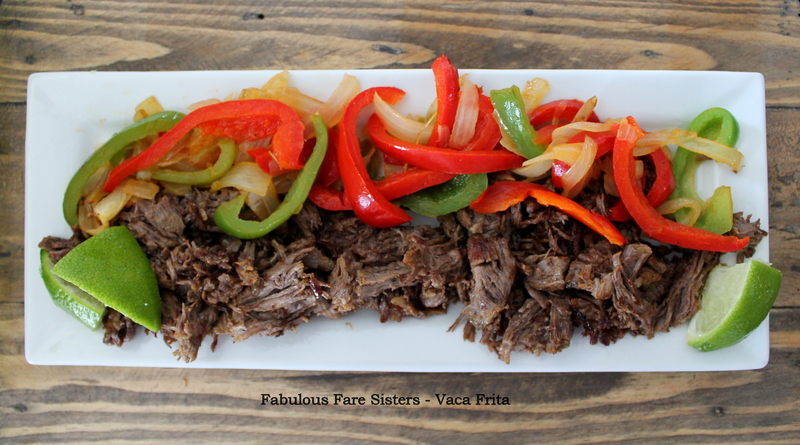 i LOVE vaca frita & have always wanted to make it! Will try your recipe soon! I FINALLY tried it – it’s amazing. Sharing on my blog today! I wish that was on my stove top right now! Oh wow, that looks absolutely mouthwatering! I agree with you on the price of flank steak! This is good Linda. Cheers. Travel is good for learning just anything isn’t it. Well done beautiful. Sounds really very delicious..love the photos..
I’ve never tried this before, it sound so tasty!